Bigger doesn't always mean better, not when it comes to laptops anyway. 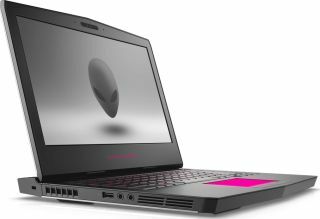 Evidence of this can be found in Dell's revamped Alienware 13, purportedly the world's first 13-inch VR laptop with some burly hardware inside. Pricing starts at a penny shy of $1,200 for one of two baseline configurations pairing an Intel Core i5-6300HQ processor with Nvidia's GeForce GTX 1060. It also has 8GB of DDR4-2133 memory, 180GB M.2 SATA 6Gbps SSD, Killer 802.11ac Wi-Fi, Bluetooth 4.1, and Windows 10 64-bit. Buying the lowest end configuration also means settling for a TN panel with a 1366x768 resolution and just 200 nits of brightness. For $300 ($1,500 total), the next model up swaps out the TN panel with an IPS display boasting a 1920x1080 resolution and 300 nits of brightness. It also doubles the RAM (16GB) and replaces the storage with a 256GB PCIe-based SSD. Dell's top two models both pair an Intel Core i7-6700HQ CPU with the same GTX 1060 graphics, both rock an QHD (2560x1440) OLED display with 400 nits brightness and touch support. The less expensive of the two ($1,800) comes with 8GB of DDR4-2400 RAM and a 256GB PCIe-based SSD, while the $2,100 model doubles up on both RAM (16GB) and storage (512GB). The refreshed design has several advantages over its predecessor. Not only is it obviously more powerful and capable of VR gaming, it's also thinner (just 0.92 inches), lighter (around 5 pounds), more durable with an anodized aluminum top cover and steel reinforcements. Dell also upgraded the TactX keyboard, which now features 2.2mm of key travel and RGB LED lighting, and improved the cooling. "The new chassis design delivers increased total system ventilation and enables a higher TDP with most of the thermal dissipation occurring towards the rear," Dell says. Even the battery is better—it's now rated a 76 watt hours compared to 51 watt hours in the previous version. The new Alienware 13 is available now.